Sol Hovtay’Daq, tera’Daq – Hoqra’ wab nuH chu’qu’ ‘oH sBASSdrum (DIvI’ Hol: logh ‘In) jan’e’ ‘ej Apple Inc App Store tengchaHDaq Daje’laH. raQlaHmeH yoq wIrenta’. SeHlaw HengDI’ lo’wI’, QoQ qu’ lIng jan. jaghpu’lI’ qogh botjan nISlaH QoQvam ‘ej jeghqangmeH SIghlaH. ngeD jommeH mIw. jan je’lu’ta’DI’ ‘ej chu’lu’ta’DI’, ‘In pIn’a’ DalaH Hoch. vabDot beq QIp po’moHlaw’ SeHmeH mIw ngeD. vaj ghopDu’ rotlhvaD pup leQmey tIn. rachchuqbogh wab yu’eghmey chenmoHlaH lo’wI’; ngeD mIw ‘ach QoQvam ‘ey law’ tuq’a’ ghe’naQ ‘ey law’. QoQ choHtaHvIS SuvwI’ ‘ol leQ wovmoHwI’mey. SIbI’ wab chu’ Qoylu’ ‘ej choHmey ‘agh cha’ jIHmey. tagh’eghqa’moHbogh janHom lo’taHvIS wab SuvwI’, wa’ QoQ ‘ay’ muchlu’taH ‘ej muchlu’taHvIS nom SIghlaH. wabmey chu’ baHmeH ‘InDaH wabmorgh vaQ je lo’laH. jatlh lIy’ jonpIn, janmeyvam qanobbogh Dalo’chugh, SanlIj DaSeHlaHchu’. bIQapjaj. puvlu’meH QaQ jajvam. janvam ngevchoHlu’DI’ wa’DIch DIlnISbe’ je’wI’. ghIq DIlnIS je’wI’pu’ chu’ ‘ach cha’ vI’ Hut Hut ‘amerI’qa’ SepjIjQa’ DeQmey neH lupoQlu’. nawlogh chaw’mey qutlh je’laH Hubbeq loHwI’pu’. ghItlhvam mughta’ loghaD ‘aj. DIvI’ Hol ghItlh tu’lu’ je. logh lengwI’pu’vaD wab nuHmey, wIy cham je ren Sequence Mediaworks LLC. nuH wa’DIch wIrenta’bogh ‘oH sBASSdrum’e’. ON TERRA, IN THE SOL STAR SYSTEM – The sBASSdrum (Federation Standard: space drum) device is an all-new tricorder sound weapon and you can buy it on the Apple Inc App Store space station. We have designed it so that humanoids can handle it. When the user fingers the control panel, the device produces fierce music. This music can disrupt your enemies’ ear deflectors and manipulate them into becoming willing to surrender. The installation process is simple. When the device has been purchased and activated, anybody can be like a great drum master. Even a stupid bekk is made to appear skilled by the simple control method. The large switches are perfect for tough warrior-hands. The user can form sound waves which reinforce each other; the method is simple but the music is as delicious as the opera of a great house. While the warrior is altering the music, switch lights verify. The new sound is immediately heard and two viewscreens show the changes. While the sound warrior is using the self-restarting subdevice, one part of the music is presented and while they’re being presented she/he can quickly affect it. In order to fire new sounds, she/he can use drum banks and a tremendous sound-array. Chief Engineer lIy’ says, If you use these tools that I give you, you can fully control your destiny. May you be successful. Today is a good day to fly. When this device begins to be sold, at first the buyer need not pay for it. Then 2.99 American Federation credits will be required. Defense Force administrators can purchase cheap squadron licenses. 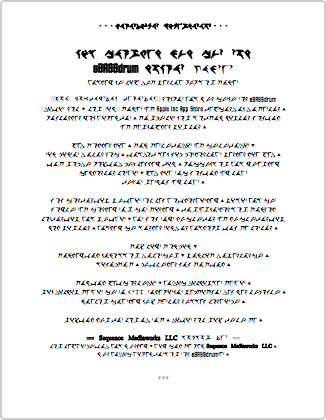 Klingon encoding and English translation by @loghaD. Sequence Mediaworks LLC designs sound weapons and tactical display technology for space-farers. sBASSdrum is the first weapon we have designed.